With just a touch of salt that sticks to your fingers. The mere mention of these sinfully delicious little spuds is a sure diet-killer for some. But here's a way to enjoy the crunch of fries without the guilt – and fat. This recipe for oven fries is quick, easy, and even pleases our household's 14-year-old French fry addict. For a burst of unexpected flavor, add some garlic, Italian seasoning, or cayenne, or even cumin. 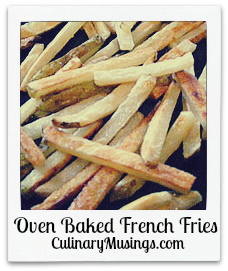 I've tried several oven fries recipes. Most were tasty, but we only made them once. The problem was that they took a long time to cook. 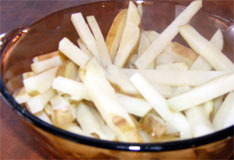 Fries cooked in oil cook within minutes, but some oven fries recipes required 40 minutes or more in the oven. And that's in addition to the prep time. This recipe uses the microwave to pre-cook the potatoes for a few minutes. That reduces cooking time to 20 minutes or less – depending on how the thickness of your fries. Preheat oven to 450 degrees. Coat a shallow baking sheet with cooking spray. Scrub outside of potatoes and cut out any bad spots. Peeling the potatoes is optional. Slice potatoes into fries. The size is up to you. 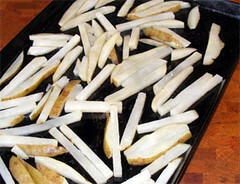 Thinner cuts will yield crispier fries, but watch them closely in the oven; they brown quickly. Place sliced potatoes into a microwave safe container with a lid. Add 2 tablespoons water and toss potatoes to moisten them. Cook 4-5 minutes in microwave on High. Microwave just until the potatoes heat up and barely soften. They shouldn't be completely cooked, as this steams them and they'll be mushy when baked. Remove potatoes from microwave and toss with olive oil and salt. 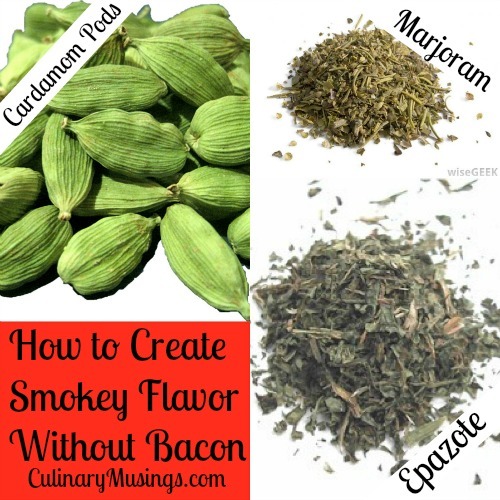 If you're adding any of the optional ingredients, mix it in as well. Place in a single layer on baking sheet. Bake for 10 minutes, then stir. 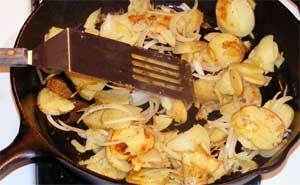 Lightly coat the potatoes with cooking spray, return to the oven, and bake until lightly browned. Serve hot. I Can't Believe It's Not Bacon!